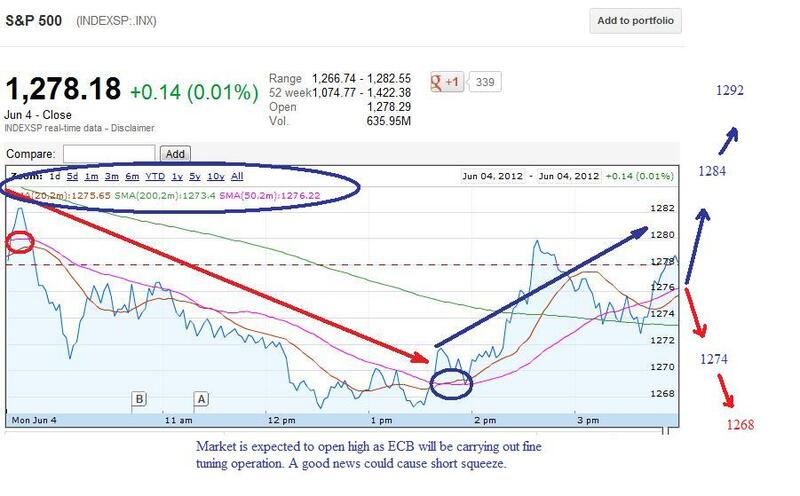 As alerted on Sunday's article, http://www.freefdawatchlist.com/2012/06/where-is-dow-heading-between-jun-4th.html Market is expected to open higher or rally till mid day as ECB is carrying out fine tuning operation. Rest of the day trend depends on the rumor out of G7. This market is not safe for investment and so reduce your risk till June 18th. For Bullish sentiment to continue: Dow needs to break 12143, followed by 12225, while S&P500 needs to break 1284. For Bearish sentiment to continue: Dow needs to break 12058, followed by 12000, while S&P500 needs to break 1274 followed by 1268. Bank of Canada Announcement 9:00 AM ET (0.25% rate cut is expected; No rate cut could lead to sell off, while a rate cut could lead to rally). ISM Non Mfg 10:00 AM ET (53.5 is expected, prev month was 53.5; higher is bullish sign lower will be bearish sign for stock market). After hours big loser: BPZ, ARB, KRG, MHR, EDS, SMBL, PDII, AAME, NTSC, APFC. Stocks for Day trading: UVXY, XIV, SVXY, TVIX, GLD, TZA, FAS, FAZ. Stocks for Option Trading: CAT, XOM, SPY, QQQ, IBM, PCLN, AAPl, WLT, PCX.